I have lived in Dallas my entire life! The good thing is I know some really great places to eat. The bad thing is so many new restaurants open and it’s nearly impossible to try them all! Today I am sharing my go to best Dallas restaurants, so if you are ever visiting the area you have a wide variety to choose from! Remember, these are MY personal favorites and everyone has their own opinions. I also have a full Dallas Travel Guide here. Yolk: One of our favorites! We always bring friends here when they come in town. Simple, easy breakfast food, amazing waffles. Snooze: Very similar to Yolk in my opinion. Great food, normal breakfast type stuff. Crossroads Diner: Best quality “diner” food you’ll have! Very family friendly! Oddfellows: A little more “hip” fun for couples, in a cool area of town. Great drinks! Breadwinners: Lots of locations around DFW, AMAZING french toast and bread. Hash house a gogo: A little more fun, huge portions, insane drinks. Taverna: Incredible patio, delicious food. Toulouse: Really yummy menu, perfect for a fun girls brunch. Neighborhood Services: A great go to date night spot, delicious food, the appetizers are amazing. Town Hearth: Really cool space, funky decor, great steaks! Sprezza: TO DIE FOR Italian food, amazing patio. Hillstone: Been going here forever. Great for lunch, dinner, patio drinks, etc. Have the fries! Mi Cocina: Our go to Mexican! The queso is amazing, everything really is amazing. Have a mambo taxi. Masero: Fun for a date night or night out with friends. The nachos and Ceviche are great! Wildwood: Saturday nights half priced bottles of wine, the spinach dip is great! Eddie V’s: Perfect for an anniversary, we had our rehearsal dinner here! Flower Child: Healthy food, great for lunch! Lemonade is amazing, have a salad! Ida Claire: Really cool place, fun for a girls birthday brunch/dinner. The Porch: Go to favorite, great for date nights. Steel City Pops: Every flavor of popsicles you can imagine, even avocado! The Dough Dough: Imagine a yogurt or ice cream place but it’s edible cookie dough! Hypnotic Emporium: Super cool place to take kids or just to go! Milk and Cream: donut sandwiches, need I say more? Cane Rosso: Pizza place thats great with or without kids. Hat Creek: Amazing burgers and an outdoor play area for kids. Snuffers: Great burgers, great drinks, super kid friendly. Hopdoddy: Another great burger place, quick service. 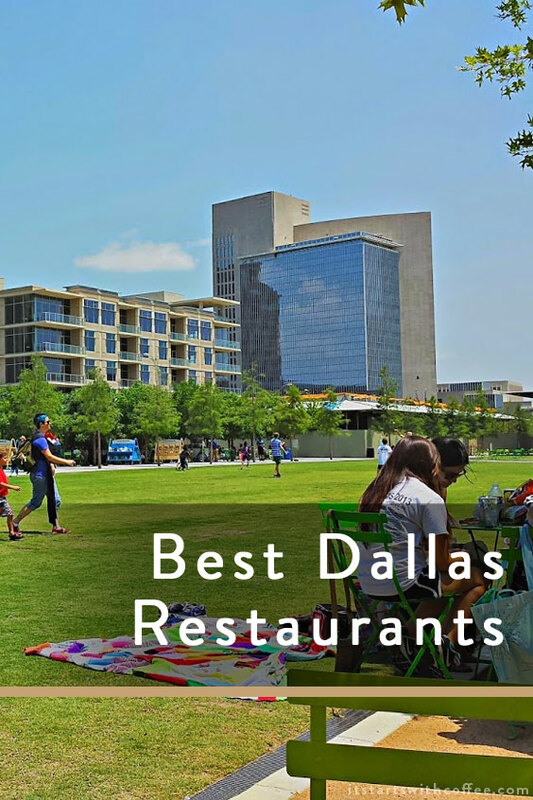 If you are a Dallas person or you’ve been here I would love to know what you would add to this list of best Dallas restaurants. I’ve only been up to Dallas once (besides layovers at DFW) when my husband and I went for BGG Spring last year. My best friend lives in the Dallas area, so we met her and her boyfriend for dinner one evening and I believe it was at Mi Cocino. It was so good! We will probably be back for BGG again so I’ll have to try some of these other ones out. This is a fantastic list! I’m printing it out because it will be useful if I do make it out to Dallas! I love dallas! There are so many great places there. My personal favorites are Babes Chicken and Razzoos!!! You so have to try them sometime! This list is so helpful! We are planning a trip there in the next couple years and needed some good food recommendations. I live in McKinney! The Porch is a favorite of mine. One of my friends went to SMU (long before we lived here) and she turned us onto The Porch. I love knowing where unique restaurants are when we’re visiting other cities. We are always excited to try new places to eat. This looks like such a great list! I have never been to Dallas, but I have a lot of family there, so I hope to visit at some point. These resturants all sound amazing. My husband travels to Dallas for work. I’ll have to share this list with him. Thank you!